This short story is a good read with a lot happening it. Wet Heat is an omega pheromones that they put off when they are still young and can have babies. Once an omega hits a certain age they no longer carry that pheromone so they can put wet heat on and make it out that they still have what it is that attracts most alphas to them. This is the position that Lee is in. I believe that even though is not still in heatand uses wet heat for his good times, he is actually still just looking for the one that will keep his attention and keep him on his toes. That is where Cain cones into play. Think that Cain is content with not showing his alpha side until he meets Lee. Lee seems to push all the right buttons in Cain and brings out what comes natural, his alpha protective side. Lee does not want to rely on anyone but himself but after getting to know Cain more and more he does not seem to able to help himself and starts to fall for him even against his own will. But he does not do it without a fight and the one thing I can say about Cain is now that he has found what or who he wants he does not give up no matter what. Even with the cat and mouse play that goes on between them, their is more to the story. Lee’s nephew finds himself in a dangerous situation and Lee does not know who to trust. Is it Cain that is after Shane or is it someone else? I enjoyed reading this book. It was very entertaining. Hmm, this was an interesting read. 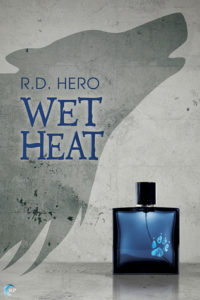 Lee is an Omega over his prime and needs a product called Wet Heat to attract lovers. He’s broke so he’s been lying on surveys to get free samples. Cain…Cain was endearing. I actually liked him a lot. He was so cute and quirky. He catches Lee on his lies, but doesn’t want to turn him in. No, Cain wants to be lovers. Lee annoyed me at some points. Not sure I liked him for Cain, really. I think I need a second book to be convinced that they end up together. The end didn’t give much closure. More like A happy for now feeling…or happy in the moment? hmm. R.D. Hero bombed out of art school. After that, she admitted writing might be the best course of action, and hopped to it. She likes writing about people who shouldn’t fall in love, which she’s been doing for about eight years. Starting with online serial fiction, R.D. developed her favorite tropes and dynamics, writing what she wanted to read.